There are a lot of things that go into the mechanics of your tennis serve. If you’re a beginning player, you’re probably aware of how important it is to have an effective serve. In today’s article, I want to talk about the importance of extending your non-dominant arm when you are serving. Balance is an incredibly important factor to help develop a successful tennis serve – and to the game itself, like any other sport. So how do you maintain the balance you need to send the ball exactly where you want it to go? The answer is to extend your non-dominant arm as high as possible when you get into trophy position before you make the serve. It’s not something that you’ll hear from a lot of tennis coaches, but if you watch professional players carefully and pay close attention to their serves, from the set-up to their follow through, you will notice it. It’s natural to want to keep your eye on the hand holding the racket, but you can learn a lot by watching what professional tennis players do with their off arm as well (as well as how they move their entire body through their tennis serve, although that’s a subject for another day). It’s surprising how much difference it makes to your game, and it’s not even something that you need to work on for weeks or months before you can start to see the effects. In fact, it’s something that can improve your serve almost immediately! We all need a little motivation from time to time as we work to improve ourselves as tennis players, and this is one of those things which is so easy to implement and so effective that it serves, no pun intended, as a powerful motivator to help you push onwards and upwards to your next goal. So now you’re probably wondering what needs to be done to take advantage of the added balance and control that comes with using your non-dominant arm effectively during your serve. It’s actually very simple, which makes this a great tip, especially for beginning players. When you’re on the court, focus on what your non-dominant arm does. When you get into the trophy position for your serves, pay a little attention to your non-dominant hand and make sure that it’s fully extended towards the sky as you prepare for your serve and keep it extended until your racquet contacts the ball. Similar to many other aspects in the game, it’s all about keeping your balance at all times. That’s where a lot of your control over the ball comes from, make no mistake. Once you master this very simple yet effective technique for your tennis serve, you’ll also be able to put more power into your serve and get the upper hand over your opponents, especially if they’re unaware of the importance of using both arms to their full advantage. 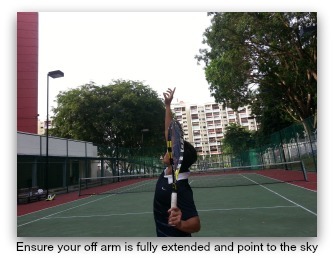 From "Tennis Serve Tips - Extending Your Non-Dominant Arm" To "How To Play Tennis Efficiently And Become A Better Player"